The New Black Panthers offered a bounty today for the capture of George Zimmerman. 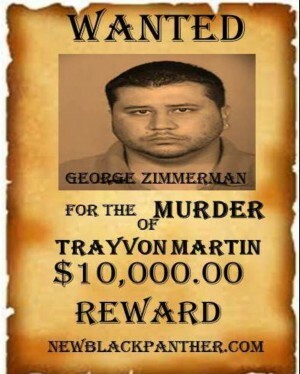 Yesterday, the radical black group issued “dead or alive” posters from Zimmerman. Members of the New Black Panther Party are offering a $10,000 reward for the “capture” of George Zimmerman, leader Mikhail Muhammad announced during a protest in Sanford today. Muhammad said members of his group would search for Zimmerman themselves in Maitland and Jacksonville — where the 28-year old worked before the shooting, employees there told the Orlando Sentinel. Our feet have been set on a dangerous path by an administration that is profoundly thoughtless in word, and belligerent in deed, towards the rule of law and the Constitution. It is the path toward warring factions, the splintering of our common society, and a constant inflammation of ethnic strife.